ATLANTA, GA--(Marketwire - Sep 10, 2012) - Take a dip with one of the new Carvel® Bonnet™ shell flavors. 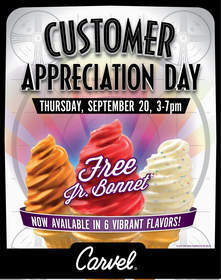 In celebration of Customer Appreciation Day, guests are invited to enjoy the classic Carvel treat featuring the best soft serve ice cream cone in the business dipped in one of our Bonnet shells for free! Now featuring a variety of new flavors, including caramel, cotton candy, peanut butter and cake mix, the Bonnet has never been better! Featuring one-day-only specials and other location specific celebrations, the annual Carvel Customer Appreciation Day is not to be missed! This year's event will take place from 3:00 to 7:00 pm, Thursday, September 20th at participating Carvel retail locations nationwide. For more information and photos, visit the Carvel online newsroom at http://carvelicecream.wordpress.com/. Also, be sure to RSVP for the event on Facebook at www.Facebook.com/CarvelIceCream. *One junior Bonnet per person. Not valid with any other offer. Offer good while supplies last, only on September 20, 2012 at participating Carvel retail locations. The United States' first retail ice cream franchise, Carvel Ice Cream has become one of the best-loved and most recognized names in its industry. The company is a leading provider of premium soft serve and hand dipped ice cream products, as well as uniquely shaped ice cream cakes, including its signature Fudgie the Whale® and Cookie Puss® cakes. Atlanta-based Carvel Corporation currently operates over 500 franchised and food service locations, and is a part of FOCUS Brands, Inc. the franchisor of Carvel® Ice Cream, Cinnabon®, Schlotzsky's®, Moe's Southwest Grill®, and Auntie Anne's®; and Seattle's Best Coffee® on military bases and in certain international markets.